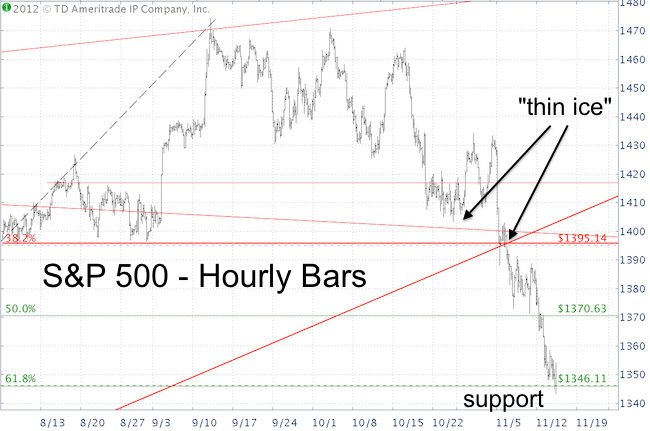 Technical Analysis – The Most Unique S&P Candle Stick Pattern Ever? Candle formations are one of the more comical technical indicators, but comical doesn’t mean ineffective. Here are two takeaways from one of the most unique SPY candle formations ever. Market analysts and market forecasters can’t be picky or biased. You can’t cherry pick data to support a bias. The tail doesn’t wag the dog and any forecast needs to be data driven. A ton of data and indicators go into each Profit Radar Report update. There are different sentiment measures, various seasonalities and cycles and a wide variety of technical indicators. Candle formations are one of the technical indicators I look at. I don’t follow them religiously, but they often add weight to the message conveyed by other indicators. 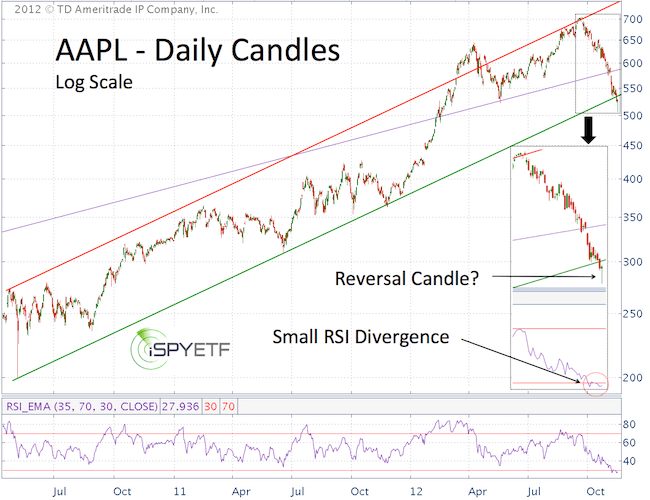 Let’s review the anatomy of a candle before we look at a never before seen candle formation for the SPDR S&P 500 ETF (SPY). 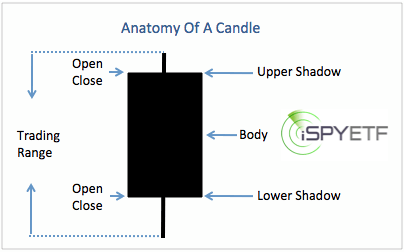 The image below shows the main components of a candle: Open/close price, body, upper/lower shadow (also called wig) and the trading range (green or yellow, depending on up or down day). 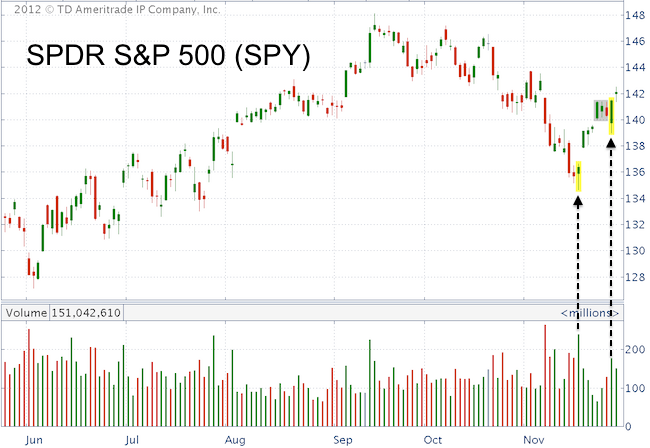 On Wednesday, the SPDR S&P 500 ETF or SPY opened below the low of the past three days and closed above the high of the past three days. This is called a triple outside day and has never happened before (see chart below). That’s a curious factoid, but has it any directional implications? It just might. There have been seven double outside days. Each of them led to positive performance of the next couple of weeks. Trading volume also picked up on Wednesday. 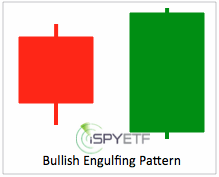 Elevated volume increases the message of any candle formation, which suggests that this rally is not yet over. A recent article here on iSPYETF.com (Nov. 19: Is it Time to Buy Apple Again?) referred to a reversal candle for AAPL at 506 and concluded that: “Prices are likely to move higher” (Apple traded as high as 595 since). The November 18 Profit Radar Report spotted a similar reversal candle in combination with a bullish engulfing pattern (see image above) in the S&P 500 and stated that: “the immediate down trend is exhausted and stocks are ready to bounce.” The S&P is up as much as 80 points since. This bounce will continue and quite possible morph into a sizeable rally as long as prices remain above support. Before we snub our noses at funny sounding candle formations, we should remember that they just called an 80-point (S&P 500) turn around. It’s easy to pick out bygone trading opportunities after the fact – hindsight is 20/20. But this article looks at live low-risk trades and provides a tutorial on how to identify low-risk trades and when to lock in profits. “Buy the best and forget the rest.” This is the mission statement of the Profit Radar Report. “Buying the best” doesn’t refer to the best stocks but to the best profit opportunities. Before we delve into the actual charts, I’d like to define what makes a quality setup. Sell: April 2010, May 2011 – Buy: March 2009, October 2011, June 2012. It’s comparatively rare for my three key indicators to align. But that doesn’t mean there aren’t any quality setups. 2) Low-risk trade: A low-risk setup is a trade with significantly higher profit potential than risk of losses. That’s because the entry point is very close to key support or resistance, which provides a powerful and well-defined stop-loss level. We haven’t had a high probability set up in nearly half a year, so the quality setups highlighted below are all classified as low-risk trades. The S&P 500 reached our revised up side target of 1,475 on September 14, the day after the Fed announced QE3. We didn’t go short at 1,475 because the new recovery came come absent of a bearish RSI divergence (the April 2010, May 2011 and May 2012 highs were all market by bearish RSI divergences). The November 14 Profit Radar Report recommended to: “Place a stop order to close half of our short position at 1,348 to take profits.” The second half was closed out at 1,371. We closed our positions for a 46 and 27 S&P point profit. At no time was the risk greater than 10 points. The 27 – 46 point gain wasn’t as great as if we entered earlier, but we had a favorable risk/reward ratio and most importantly low-risk profits. Corresponding ETFs are the Short S&P 500 ProShares (SH), UltraShort S&P 500 ProShares (SDS) or the S&P 500 SPDR (SPY). “According to the latest Commitments of Traders (COT) report, small speculators are now holding the most net long gold positions in a quarter century. Friday’s action also produced a red candle high. Both developments are generally bearish. However, as mentioned in Wednesday’s PRR, gold prices remain above quadruple support (2 trend lines, 20-day SMA, and 61.8% Fibonacci). As long as prices remain above support we’ll give this rally the benefit of the doubt. A move/close below 1,765 will be a signal to go short for aggressive investors with a stop-loss at 1,775” (later raised to 1,777). When should we take profits? 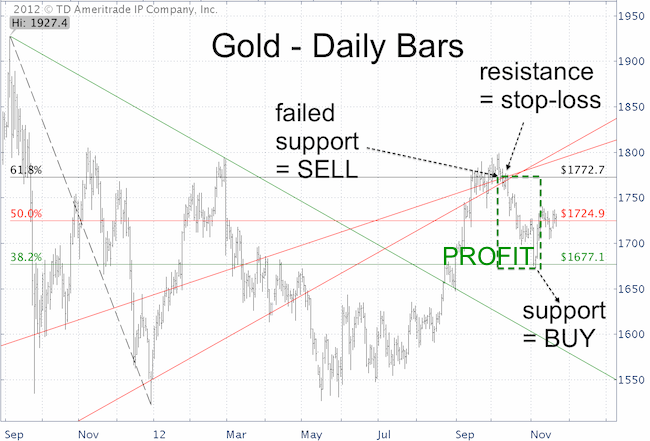 The October 25 Profit Radar Report said this: “Gold dropped to support at 1,700 today. We are getting to a point where it becomes tempting to lock in a 65-point gain. Since gold hasn’t seen a daily bullish RSI divergence yet either, we’ll hold our short position. We’ll sell half of our holdings at 1,680. We sold half of the gold position at 1,675 in early November and the second half at 1,725 a few days later and captured a 5% and 2.5% profit. Corresponding ETF trades were a) short the SPDR Gold Shares (GLD) or b) buy the UltraShort Gold ProShares ETF (GLL). 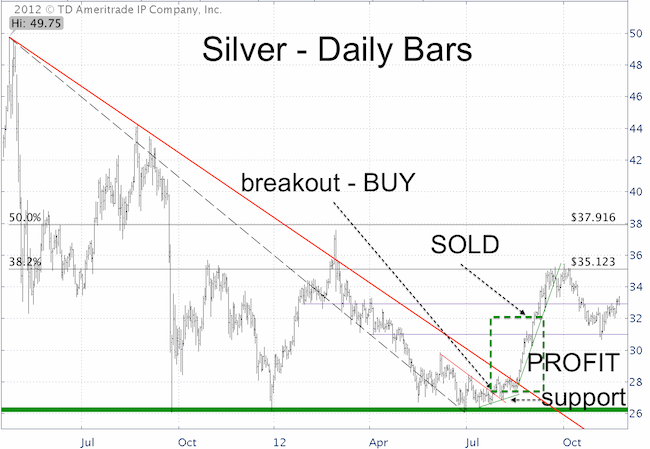 Silver broke above trend line support on July 25 at 27.30. This was a buy signal. Our stop-loss was at no time more than 2% below the entry price (initially red, than green trend line). In hindsight we could have held on to the position as long as the sharply ascending green trend line remained in tact, but hindsight is 20/20. We closed the position around 30 and 32 for a 10% and 16% gain in the iShares Silver Trust (SLV). Future low-risk and high probability trade signals are available via the Profit Radar Report. Simon Maierhofer shares his market analysis and points out high probability, low risk buy/sell recommendations via the Profit Radar Report. Click here for a free trial to Simon’s Profit Radar Report. Forget “sell in May and go away,” the Thanksgiving VIX trade is statistically one of the biggest, if not the biggest, seasonal moves of the year. However, the year 2012 features one rarely seen caveat to VIX seasonality. November/December is statistically the season for the best VIX trade of the year. On average, since 1990, the VIX drops 35% from Thanksgiving to Christmas. The chart below illustrates the sharp VIX (Volatility Index) move from the November high to the December low. This year however, investors have to deal with a caveat. The VIX is in a funk. How so? The VIX resisted the usual tendency to rise into Thanksgiving and is currently trading near its low for the year. This is even more of a head scratcher considering that the S&P 500 (SPY) just dropped as much as 9.5%. Due to the inverse correlation between VIX and S&P, the VIX should have soared for much of November. Quite to the contrary, the VIX actually dropped during the time the S&P fell hardest (November 7 – 16). The table below shows the VIX closing price of the day before Thanksgiving and the pre-Christmas low (which has occurred between December 21 and 23 the past five years). A measured 35% drop from this year’s pre-Thanksgiving close would draw the popular volatility measure below 10, a level last seen in February 2007. This isn’t impossible, but it’s improbable. In short, the VIX trade doesn’t look like a high probability trade this season. Even at the best of times, it’s difficult to monetize moves of the fear index. That’s because the VIX itself can’t be traded. There are tradable vehicles that have been created, but they all have complex idiosyncrasies. Trading the VIX is almost like catching the wind. Many of those unseen idiosyncrasies cause price deterioration and make it difficult to capture profit. 1) Options 2) Futures 3) ETFs/ETNs. VIX options are subject to price decay. VIX futures usually find themselves in a state of contango or backwardation. VIX ETFs or ETNs are based on either VIX options or futures (futures are more commonly used). Imagine buying a car and trying to sell it for a profit. As a private party you have to pay sales tax (7.25% in CA). If you buy a car for $10,000, you have to sell it for more than $10,725 (purchase price plus tax) to make a profit. Contango is like the sales tax. Some research on the iPath S&P 500 VIX Short-term Futures ETN (VXX – the most heavily traded VIX ETN/ETF) suggests that the cost of contango is about 0.25% – 0.45% per day. Contango usually occurs when the VIX trades below 25. When the VIX rises above 25 it usually suffers from backwardation. Backwardation is the opposite of contango, and happens when the spot price is higher than the front month futures. While contango eats into returns, backwardation can enhance the return of VXX. While we likely won’t trade the VIX this year, the VIX research isn’t totally wasted. The VIX suggests rising prices and some sort of a year-end rally. This may provide trading opportunities for the S&P 500 and other equity indexes. Instead of becoming the first 1 trillion dollar company, Apple’s market cap shrunk by more than $200 billion. Apple today is almost 30% cheaper than it was just a couple months ago. Is now the time to buy? 28 – If you follow Apple shares you probably know what this number stands for. 28% is how much AAPL dropped from September 21 to November 16. That’s a terrible situation if you own AAPL, but great news if you are a bargain buyer – AAPL is now almost 30% cheaper than it was 40 trading days ago. Does that mean it’s time to buy AAPL? The answer depends on your time horizon. A November 15 CNBC article titled “Apple stock hit by panic selling: Someone yelled fire” (that’s good for the short-term, more about that below) pointed out that more than 800 hedge funds and mutual funds counted Apple among their top ten holdings at the end of the third quarter. Well no kidding Sherlock, that information would have been useful a few weeks ago. “About one-third of all U.S. stock mutual funds own Apple. One in five hedge fund managers holds Apple amoung their 10 largest bullish positions. Only 2 of 54 analysts have a sell rating on Apple. 40 dividend focused funds own Apple. Apple is the single biggest holding of Goldman Sachs’ U.S. Equity Dividend and Premium Fund. Yet Apple has never paid a dividend. 50 small and midcap funds own Apple. Yet Apple is the largest company in the world. The financial market was more than just saturated with Apple stock, it gorged on AAPL and I doubt that – over the long-term – a 28% drop will cure the saturation hangover. After falling as low as 506 on Friday, AAPL staged a nice reversal and closed at 527. In the process it created a green reversal candle against a small bullish RSI divergence (price made a new low, RSI did not). A similar constellation happened on November 9, but prices continued to fall lower. The difference between Friday’s (November 16) and the November 9 green candle is volume. Friday saw the most shares change hands since March 13. In short, AAPL is showing signs of life and prices are likely to move higher, but I think an even better opportunity lies ahead in the near future. The Profit Radar Report analyses the markets and the forces that drive the market. Such forces include technicals, sentiment, seasonality, and recently the performance of Apple. Sunday’s report includes a multi-month forecast for the S&P 500. What’s Killing Stocks and What May Resurrect them? It’s better to be out of stocks wishing you were in, than in wishing you were out. But it’s best to be short stocks when stocks are down. The short trade has worked well, but how much more down side is there? Every kid knows you better eat your ice cream before it melts. Investors should know to lock in profits before they disappear. The recent 8.6% drop in the S&P 500 and 12.6% fall in the Nasdaq-100 has certainly done some technical damage and erased a fair amount of profits. What has caused the market’s sell off and how much worse can it get? There’s never just one event that triggers a market sell off, but as far as the recent sell off is concerned there’s one reason that weighs heavier than any other: Apple. Apple had an incredible run, soaring from $80 in 2009 to $705 in September 2012. Apple became the most valuable company in the world and in the process controlled 20% of the Nasdaq-100 and 5% of the S&P 500. Apple was like a “dictator of the financial market.” As Apple goes, so goes the market. But that relationship is a two-edged sword, because when Apple sneezes the market will get a cold. So how was Apple’s health? According to the Wall Street Journal, “Wall Street analysts are increasingly bullish as Apple hits fresh highs” (August 27, 2012) and MarketWatch wrote “Apple seen as trillion dollar baby” (August 21, 2012). Apple has fallen over 25% from its September high and dragged every major U.S. index with it. If you’re looking for a scapegoat, look no further than Apple. The S&P started to tread on “thin ice” in late October. Why thin ice? Because it was trading perilously close to key support around 1,400 (see trend lines in the chart below). The thin ice finally broke when the S&P fell through key support at 1,396. The chart below was originally published in Sunday’s (Nov. 11) Profit Radar Report, which included the forecast for the week ahead. Below are a few excerpts from Sunday’s PRR. “We are short with the S&P’s drop below 1,396. How low can stocks go? The chart below shows two important levels: 1,371 and 1,346 (updated chart shown below). The S&P sliced through 1,371 on Wednesday, and Friday’s trade drew prices as low as 1,343. Since our weekly target has been met we’ve sold half of our short positions. This doesn’t preclude lower prices, but a bounce is possible and it’s smart money management to eat your ice cream before it melts, or take some profits before they disappear. 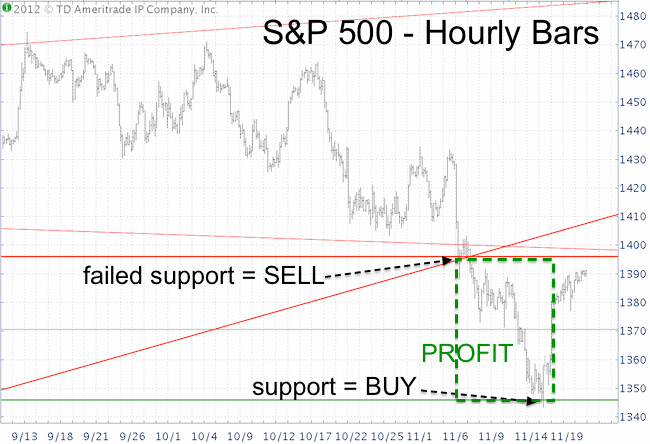 Continuous target prices and buy/sell levels will be provided by the Profit Radar Report. In a world of iPhones, social media, and twitter, it’s easy to forget about time proven market forecasting techniques. But just because there isn’t an app for dividend-based value analysis doesn’t mean it’s not working anymore. Nobody likes to get trapped. Animals don’t like traps, humans don’t like traps, and investors hate money traps. But how do you distinguish a profit opportunity from a profit trap? From October 2011 to September 2012 the S&P 500 gained 37%. Was this the beginning of a new bull market or the final leg of the QE bull market? From March 2009 to September 2012 the S&P 500 soared 121%. Is this rally a new bull market leading to new all-time highs or a monster counter trend rally? Charles Dow, the founder of the Wall Street Journal and original author of the Dow Theory, said that: “To know values is to know the market.” Yes, valuations might well hold the key to the above questions. A special report analyzing all four valuation metrics was sent out to Profit Radar Report subscribers on Thursday. This article will look at one metric: Dividend yield. Company A trades at $100 a share and pays a dividend of $5 per share. Company A’s dividend yield is 5%. If company A’s shares soared to $200 a share without dividend increase, the yield will fall to 2.5%. There’s a direct correlation between a company’s share price and its dividend yield. Higher stock prices lead to lower yields. Low dividend yields are a result of pricey stocks. Dividend yields are probably the purest measure of valuations. Unlike P/E ratios, they can’t be fudged and massaged (although the current dividend yield is likely inflated by the Fed’s low interest rate policy, which makes it easier for companies to accumulate the cash needed to pay dividends). Since the year 1900 dividend yields for the S&P 500 have averaged 4.25%. The SPDR S&P 500 ETF (SPY) currently yields 2.02%, 52.5% below the historic average. The current yield is much closer to the all-time low of 1.11% (August 2000) than the all-time high of 13.84% (June 1932). 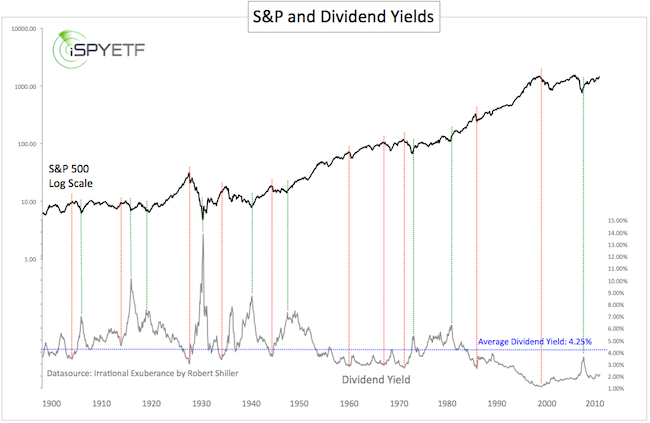 The chart below juxtaposes the S&P 500 (log scale) against dividend yields and shows that every major market top coincided with a yield low, and every major market low coincided with a yield high. Dividend yields aren’t currently at an extreme that requires an immediate drop in stocks, but they do suggest that stocks are overvalued. What do low yields mean for investors? Valuation metrics are long-term forecasting tools, they shouldn’t be used to enter or rationalize short-term trades. The long-term message of dividend yields is that the down side risk is greater than the up side potential. The next big move will likely be on the down side. The best entry point for long-term trades is usually discovered by shorter-term market timing tools. Every prolonged decline starts on the hourly and daily chart. The Profit Radar Report monitors long-and short-term market timing indicators to identify low-risk high probability trading opportunities. Technical analysis suggests lower prices, but seasonality points towards rising stocks. Is it possible to find a worthwhile trade in this conflicting environment? Yes it is. Find out how here. The S&P is caught between a (seasonal) rock and a (technical) hard place. How so? Seasonality for the remainder of the year is predominantly bullish, but the recent selloff has caused some technical damage. The technical picture is bearish unless the damage is “repaired” by a move back above resistance. There’s an obvious conflict between indicators, which makes identifying high probability trades more challenging. When all three indicators are in alignment, there’s a high probability of a profitable trade/investment. That’s why I call it a high probability trade. The Profit Radar Report continuously monitors technicals, sentiment, and seasonality to find high probability trades. Prior high probability trades include going short in April 2010 and May 2011 along with buy signals in March 2009, October 2011, and June 2012. Bearish technicals currently disagree with bullish seasonality. Sentiment is more or less neutral. The three pillars don’t align. There is no high probability trade set up right now, but that doesn’t mean there aren’t any good trades. When indicators don’t align for high probability trades, the Profit Radar Report looks for the next best opportunity: A low-risk trade. A low-risk trade has a higher reward than risk potential. In fact, the risk is limited by a well-defined support/resistance level used as stop-loss. The chart below shows the most recent low-risk trade for the S&P 500 (SPY). The thick horizontal red line is the 38.2% Fibonacci retracements of the points gained from June – September 2012 at 1,395. 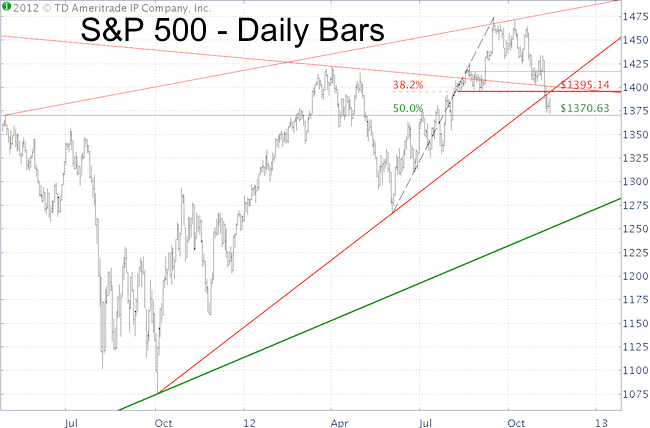 This level is reinforced by the ascending red trend line from the October 2011 low and S&P 1,396, which provided support several times in August/September. In short, S&P 1,396 is a key support/resistance level. The S&P’s drop below 1,396 triggered a sell (as in go short) signal with a stop-loss a few points above. This makes it a low-risk trade. Next support outlined in Sunday’s Profit Radar Report is at 1,37, which is made up of the 50% Fibonacci retracement and the April 2011 low. The S&P hit this support on the nose this morning and bounced 19 points. A break below 1,371 will unlock more bearish possibility, with the potential for a steep decline. Regardless the size of the down move, going short at 1,396 keeps the trading “foot in the door” in case there will be a waterfall decline. All with minimal risk. The stop-loss just above 1,396 protects the “foot” against any bruising. This is important because there are some bullish possibilities. For right now, the down trend is our friend, but we are fair weather trend friends willing to shift with a move above resistance. 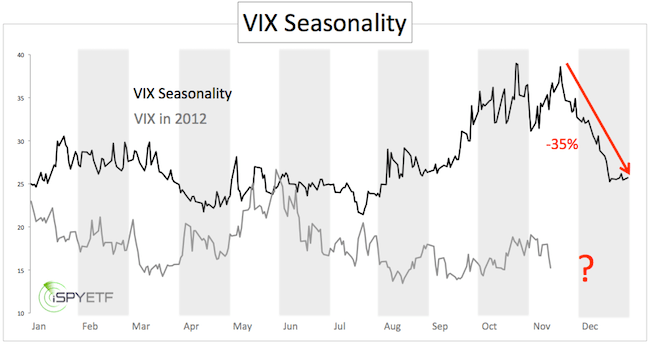 The VIX seasonal pattern shows a clear seasonal opportunity right after Thanksgiving. This may make for a juicy VIX and stock trade if technicals confirm the message of seasonality. The Profit Radar Report outlines high probability and low-risk opportunities along with the support/resistance levels needed to manage an active trade effectively.